Working together, we can make it work! Birds take advantage of windy ridges and other land-forms that create thermals and updrafts to carry them on their migrations. These same windy locations recommend themselves for wind-power turbines. It’s a tricky problem: On one hand, a Department of Energy report calls for the US to generate 20% of its electricity from wind by 2030. But wind farms can kill birds that collide with spinning turbines and associated structures. American Bird Conservancy has developed Bird-Smart Wind Guidelines that include careful siting, intermittent operation during peak migration times, and rigorous monitoring. We can benefit from wind power while lessening the damage to birds! According to American Bird Conservancy or ABC, “Wind power, a rapidly developing source of energy…can be an important part of the solution to climate change.” However, wind farms can kill birds that collide with spinning turbines and associated structures. ABC has developed a web map showing more than 2,000 locations in the United States where birds will be vulnerable to wind energy development -- places like the Rainwater Basin in Nebraska, where half a million birds pass through each migration. How to solve this conundrum? 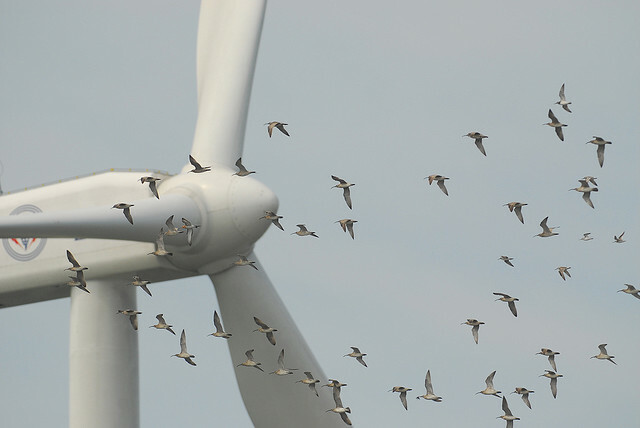 Careful siting, intermittent operation during peak migration times, and rigorous monitoring are some of the ways we can benefit from wind power while lessening the damage to birds. To see ABC’s Bird-Smart Wind Guidelines begin at our website, BirdNote.org. Calls of Sand Hill Cranes  provided by The Macaulay Library of Natural Sounds at the Cornell Lab of Ornithology, Ithaca, New York, recorded by A.A.Allen. What does it take to record the world’s birds?